In this document we mainly will right panel options. Screen Setting mainly used to apply same property to all the screen controls. In right panel tapping on page layout will open up the following window. 1) Apply to screen’s all objects :Enabling this will give you option to change only those properties that are changed in this window. Tapping on save will apply all the properties to all the controls. 2) Properties : Different control’s property is given in this window to be apply on the controls. Lets discuss about the properties. Below properties are explained in detail in Label Control. Please refer Controls - 2 Text document. Below properties are explained in detail in button Control. Please refer Controls - 3 Buttons Controls document. Below properties are explained in detail in button Control. Please refer Controls - 3 Buttons document. Application Layout mainly used to apply same property to all controls of all the screens of the app . In right panel tapping on application layout will open up the following window. Apply to all screen objects : Enabling this will give you option to change only those properties that are changed in this window. Properties : Only those common controls properties are available that are available in all the screen. 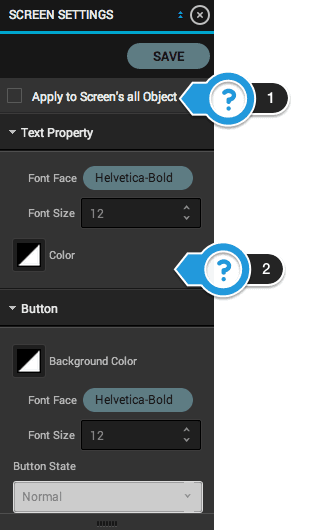 Below properties are explained in detail in Navigation Bar Control. Please refer Controls - 1 View document. 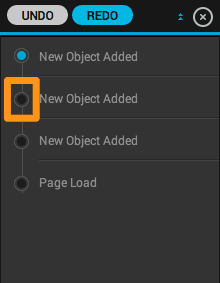 Below properties are explained in detail in Navigation button Control. Please refer Controls - 3 Button document. Below properties are explained in detail in View Control. Please refer Controls - 1 View document. To integrate third party apis you need to do few configuration in Third party Option in right side panel. Tapping on Third Party will open up the following window. A number of third party apis are provided here. 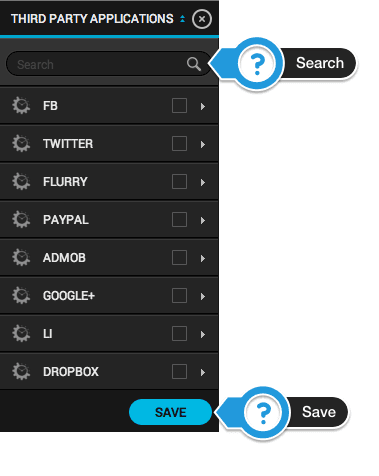 You can make use of search to search the api. Tap on done to add any of the above Api. In this document we will show the example of Facebook and Twitter . Select on facebook and twitter and tap on done to configure the facebook and twitter api in the app. 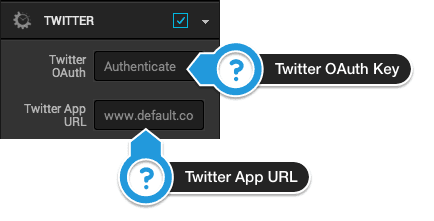 As per the selection FB Application ID, Twitter OAuth and Twitter App URL need to be provided. Tap on Save button to save all the configuration. This is very important while configuring the facebook or twitter or any other api in the app. You need to provide proper data related to apis in this window for successful configuration in the app. As the name itself suggests its a one kind of notification from any app that gives updates about any event in the app. 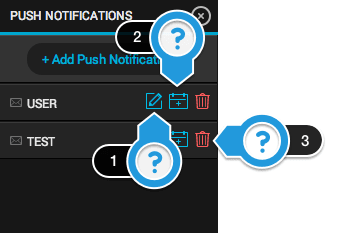 In the right panel there is a option to configure push notification in the app. Tap on Add Push Notification to configure datasource for the app to receive push notification. 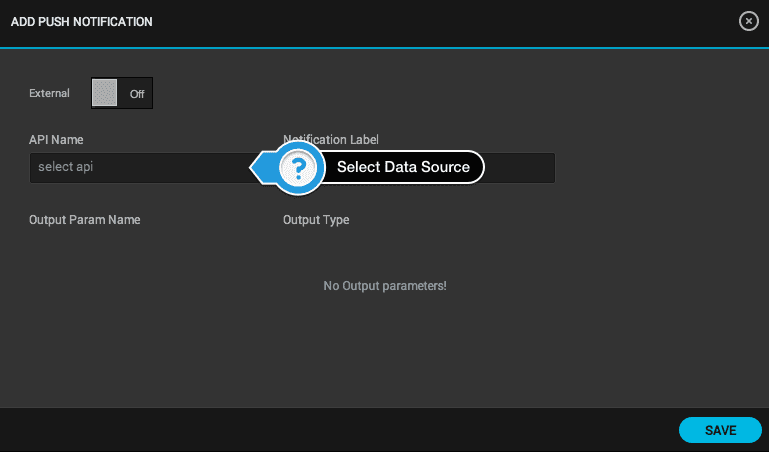 Following window will open where you can configure datasource for push notification. Note : Only those datasource will available that are having push notification module. Edit : Edit the configured datasource. 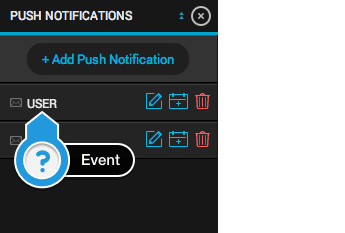 The action related to this event will be called when user taps on the view button of the alert of the push notification or slides out the notification on the home screen of the device or taps on the view from the Notification tray. Double tap to add any action on this event. Delete : Delete the datasource. 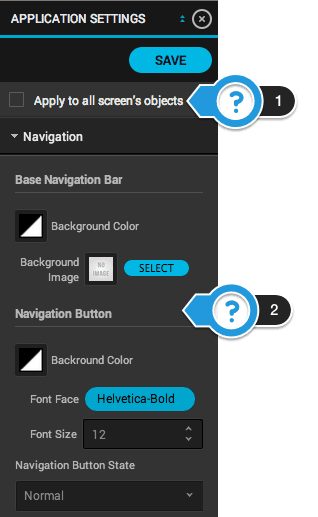 This option is used to switch project and rollback the changes in the screen. You can search the apps from the list of apps. 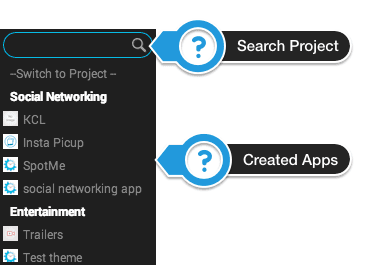 To switch on to other project tap on any of the projects in the list. After tapping whole configuration of the selected project will be loaded in the window. In this tool the summary of the last change of the UI of the current screen can be trace through this option. You can revert back to previous change on the screenby tapping on this Dot button. You can go back forth on this slider of changes by tapping on the dot button. After refreshing the page you won’t be able to trace the changes.